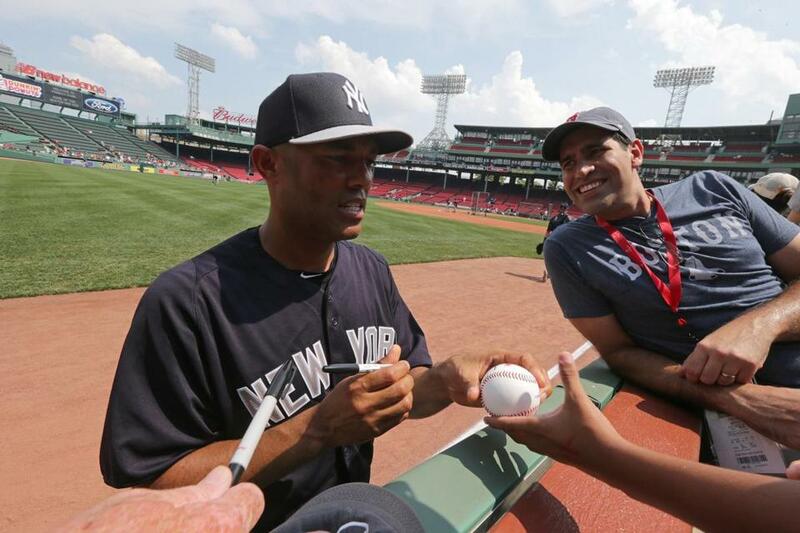 Mariano Rivera, retiring after 19 years, met with a special group of people in a luxury suite then took time to talk to fans and sign autographs. Mariano Rivera played his first game at Fenway Park on July 16, 1996. He was a setup reliever then and pitched two innings against the Red Sox. Joe Girardi, who manages the Yankees now, was the catcher. John Basmajian can’t remember for sure, but he probably was at the game that day. The guy everybody at Fenway calls “Baz” has been working at the park for 46 years selling tickets. In the years since, surely their paths crossed. If you count the postseason, Rivera has walked into Fenway Park more than any ballpark other than Yankee Stadium. Baz? He’s as much a part of Fenway as the Pesky Pole. On Saturday, the two career baseball men finally met. Rivera will retire after this season after 19 record-setting years and wants to leave the game with memories that go beyond wins and losses. So he is holding small, informal meetings with people at every park he visits. Yankees media relations director Jason Zillo, who consulted with Rivera on the unique farewell tour, works with teams on finding a representative group for Rivera to spend time with. It can be fans, team employees, or some combination of the two. The Red Sox gathered 14 people in a luxury suite three hours before Saturday’s game against the Yankees. The eclectic group included four long-time team employees: Basmajian, usher Ken Greenwood, security man Ed Dalton, and vice president of ticketing Richie Beaton. Together, they’ve worked for the Sox for 135 years. There were two youth players, Clifford Guerrero of the South End and Brenna Galvin from Dorchester, and two youth coaches, Aaron Barnes and Sandra Santana. Jimmy Fund patients Fernando Morales and Harry Clark were there along with their fathers. J.P. and Paul Norden, the brothers from Stoneham who lost legs in the Marathon bombings, were the last to enter the room. The meeting lasted about 40 minutes and caused Rivera to miss some of batting practice, but it was evident this meant far more to him. After a brief introduction from Zillo, Rivera led a discussion that lasted 40 minutes. He spoke softly at first then a little louder as he encouraged others to join in. Rivera called all of the participants by name, too. People he had never met before and might never see again were treated with the respect he would show a teammate. Rivera encouraged Clark, a 13-year-old from Wellesley who is visually impaired by an inoperable brain tumor, to share his story with the room. He did the same with Morales, a 19-year-old from Norwood who had to give up his sport, soccer, because of Ewing’s sarcoma. In both cases, the room applauded the courage of the two young men. Greenwood was curious about how Rivera stays so calm on the mound, saying it was something he had admired from the stands over the years. Basmajian asked Rivera what role religion played in his career. The two then spoke at length about their shared Christian beliefs. Rivera said he credits his faith for his success and tries to stay humble. “I wish more [players] had that,” Basmajian said. “I wish that, too,” Rivera responded. Rivera would have stayed longer, but Zillo prodded him out of the room to get back to the field. But he lingered, shaking hands and leaning in for whispered conversations. The Norden brothers, quiet during the meeting, stood to greet Rivera at the end and posed for photographs with him. Rivera also handed out autographed baseballs with the date on them. Barnes, who had asked Rivera for advice about how to motivate his players, walked out of the suite smiling. Later on, while sitting in the dugout, Rivera said he has enjoyed his time at Fenway. The fans at Fenway gave Rivera a standing ovation when he came out of the bullpen to pitch the ninth inning. He picked up the save as the Yankees won, 5-2. Correction: Because of incorrect information provided to the Globe, an earlier version of this story misspelled the name of John Basmajian, a Red Sox employee who works in ticket sales.